Day two of qualifying for the Seamaster 2018 ITTF World Tour Platinum German Open in Bremen has plenty of exciting fixtures to look forward to with major head-to-head battles taking place and group stage qualification at stake on Wednesday 21st March. We have a potential thriller on our hands in Group 45 of the Men’s Singles qualification group stage as Austria’s Daniel Habesohn takes on the master of defence Panagiotis Gionis; the Greek player has prevailed on the two previous occasions they met on the international stage, but who will come out on top in Bremen and secure first position in the group? Another match worth following closely sees Gustavo Tsuboi and Bojan Tokic do battle for top spot in Group 40. Tsuboi enters the final group stage tie ranked 70 positions higher than his opponent, but Slovenia’s Tokic has enough quality to cause an upset and emerged victorious in his previous international encounter with the Brazilian at the 2012 ITTF World Tour event in Slovenia. India’s Amalraj Anthony and Frenchman Abdel-Kader Salifou are just one victory away each from finishing at the top of Group 49: meeting in the final round of group stage fixtures Anthony and Salifou will fight it out to decide which player books their place at the summit of the group. 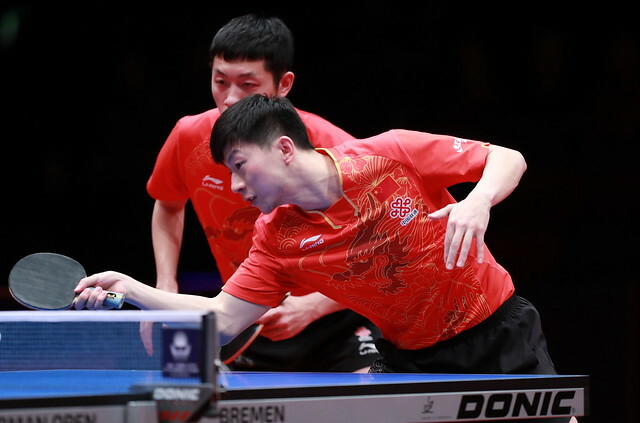 Wu Yang and Liu Jia have seven ITTF World Tour Women’s Singles gold medals between them and have both been crowned champion at past editions of the German Open. When the Chinese and Austrian representatives meet on Wednesday the battle will take place in the qualification group stage – who will win in their first head-to-head encounter on the ITTF World Tour? Both present at the recent 2018 ITTF Challenge Polish Open, Korea Republic’s Jeon Jihee and Japan’s Miyuu Kihara will compete in a play-off for first position in Group 21 in Bremen while there’s a similar scenario to be played out in Group 17 as Puerto Rican star Adriana Diaz faces Mizuki Morizono. Alongside matches from the two senior singles competitions both Under 21 events will host two rounds of action, including quarter-finals encounter to close out the day in Bremen.